“FD 5” begins with a young man named Sam and a group of his co-workers from a paper plant assembly factory. They jump on a chartered bus to attend a corporate retreat. While stopped in traffic on a bridge, Sam has a vision. The suspension bridge that is under construction starts to crumble and collapse. Sam is able to convince 7 of the crew to get off the bus with him and the rest are left for dead. But..it turns out death doesn’t like to be cheated and soon the remaining eight die one by one. Original concept? No. Great acting? No. Wonderful story? No. But..let’s be honest…who cares? 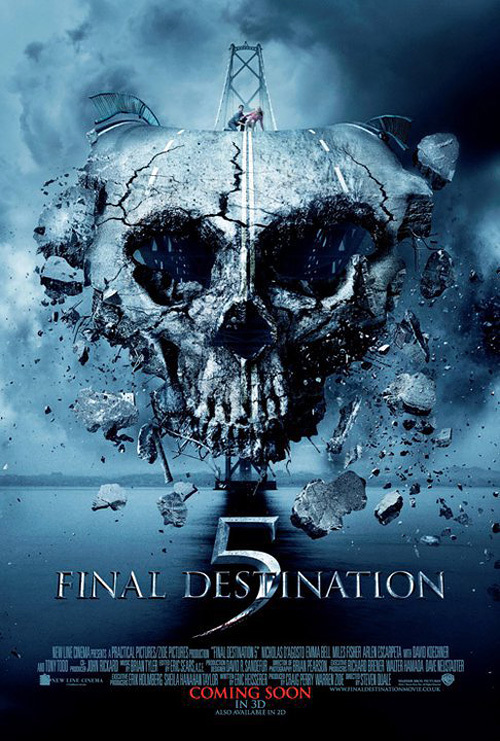 “Final Destination 5” is the most fun I’ve had in the movies in months. Probably the most fun I’ve had watching a film since “Scream 4” opened in April. This movie works from beginning to end thanks to some incredible death scenes and some solid performances. This is actually the first “FD” movie that I’ve seen since part 2 in which I actually CARED about the characters. This isn’t a perfect movie. The middle drags a bit and I did feel a bit cheated by at least one death. Nonetheless, this is by far and away my favorite of the series. Just don’t let ANYONE give away the twist ending. That’s the best part of all.